Although I myself am a fairly new Stars fan, just 6 years now, my husband has been a Stars fan since they came to Dallas in 1993. The true reason he is such a Stars fan would have to be because of Ed Belfour. He is my husband’s absolute favorite player with Mike Modano obviously being a very close second. My husband told me Belfour was the reason he started playing hockey, and the reason he worked so hard to become a goalie. It was an incredible experience for me seeming him when he came for the 20th anniversary game in which they honored him last year! It was incredible to see my husband get chills watching Belfour’s highlight video and see him coming out on the ice he was completely speechless! Seeing how much this man had impacted my husband’s life I went searching to find something to do with Belfour that I could give Josh for his birthday…and I found it! 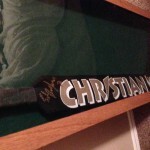 I was able to find a signed goalie stick of Belfour’s from the 1999 Stanley Cup Season! I had my Dad make up a really nice case for it and gave it to Josh on his birthday! I don’t think he has ever been that happy with a present! So now we have added Old School Stars memorabilia to our ever growing display for THE best team in the NHL! Go Stars!!!!! This is Part 1 of a three part series about the 1998 Playoffs and “The Best Game I Ever Missed”. Watch for Parts 2 to come on April 9th and 12th, 2013. After finishing second in points in 1997 the Stars were upset in the first round by the Edmonton Oilers. Determined not to let this happen again the Stars made big news signing free agent Ed Belfour in the offseason. Struggling early in the season with his new defense Belfour finally got into the groove and lead the team to its first President’s trophy and the team’s best record ever, to that point. 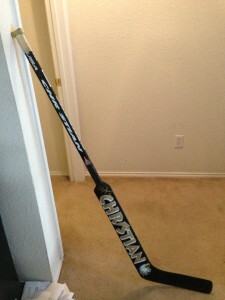 The playoffs were here again and first on his plate was Eddie’s last team, the San Jose Sharks. The San Jose Sharks went all out at the trade deadline in 1997 to get Belfour from the Blackhawks in hopes they could work out a deal to resign him. It did not work out and this was their chance for payback with their new goaltender and playoff MVP from last season, Mike Vernon. The payback however did not involve the men between the pipes. The last season had taught me that with all the excitement that went with playoff hockey also came moments of extreme bitterness. The previous year was my first as a season ticket holder and being upset in the first round had taught me such bitterness. I was 0-4 in playoff games because all four losses in that series were at home. I was eager to end that streak and to taste playoff victory for the first time. I did not take long for this series to get ugly. Bryan Marchment of the Sharks, who was known for his cheap shots on the other teams key players went to work and may have prevented the Stars from skating the Cup a year early. Marchment took out Joe Nieuwendyk’s right knee and forcing him out of the game. This was only game one of the playoffs and even though the Stars dominated the game in a 4-1 win the victory was bitter-sweet. All my thoughts were on if and when Joe could return. Nieuwendyk was the Stars leading scorer for the season and a huge loss for the team. Our worries were confirmed when we learned that he had suffered a torn ACL and would be out for the season. The Stars went on to dominate game two as well and you couldn’t help but think this series was over. Someone forgot to inform the Sharks of that though as they took the next two in San Jose to tie the series. Game five in Dallas again was a nail bitter as the Stars escaped a close one with a 3-2 win. I was living and dying with every shift. Every goal for or against was leaving me on emotional highs or lows. Game six was in San Jose and we really needed to end it there because I was not ready for another game seven. It was another close one and when San Jose forced overtime I could only think, “Oh no, here we go again!” I would have been devastated had the Sharks scored and sent us to another game 7 in Dallas. Another chance to watch my team exit early in round one again would have been too much to bear. Trade deadline acquisition Mike Keane eliminated my fears and the Sharks with his overtime game winner. Injuries to Nieuwendyk and Jere Lehtinen crippled the Stars, but it did not keep them from winning the series in 6. The Sharks provided a few firsts for me in hockey. My first ever Stars game I went to was a victory against the Sharks in 1995. My first playoff win and series win as a season ticket holder came this series as well as one more first. A tradition was born that series. To celebrate the playoffs my cousin and I wanted to try something different. We noticed a booth outside Reunion Arena that offered free face painting and so both of us had our faces painted all three games of the series. It was fun and we didn’t really think anything of it until a fellow season ticket holder informed us of an interesting coincidence. Having already painted up our superstitious friend had thanked us and pointed out that our personal records were 0-4 without face paint and the Stars were 3-0 when we dawned the war paint. Round one was tough but over it was now time for some revenge in round two.